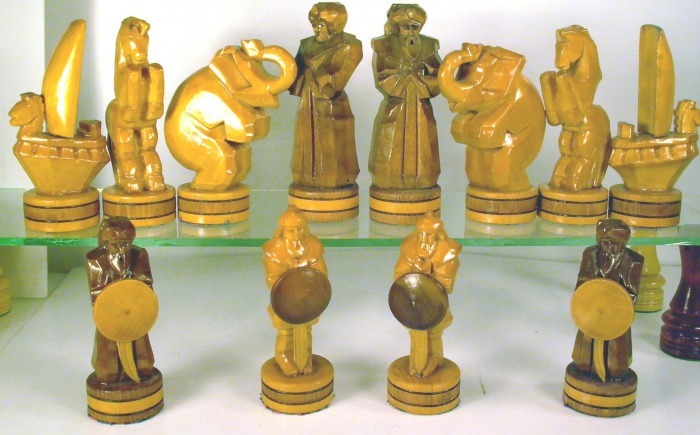 Older Russian chess men, from pre-2.WW most likely, large and weighted. 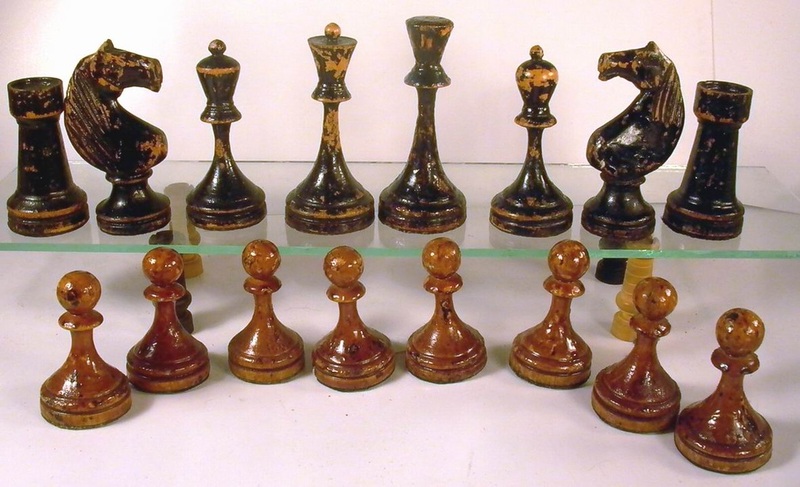 What stands out is the filthy and sticky varnish - possibly a failed attempt at restoration? Early 60ies, well finished and somewhat market by time and play. Kings stands 94 mm, bases are felted, no weight - excellent stability though wide spreading bases. 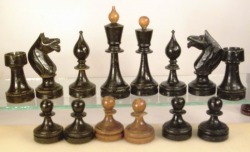 Fairly light wood, the black side is blackened. 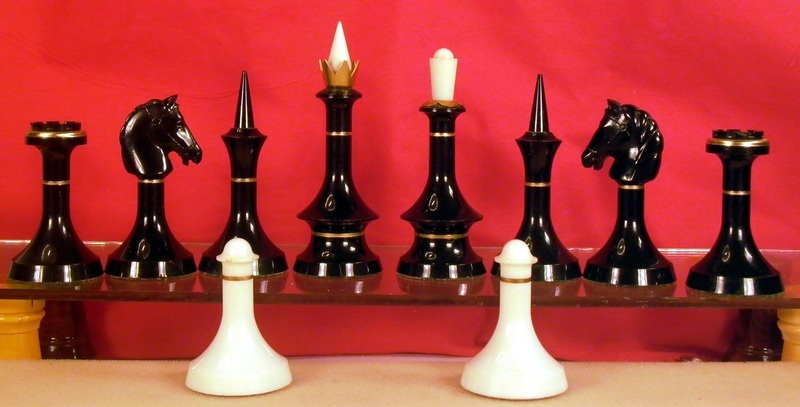 The finials are separate wooden pieces, inserted into a hole in the top of kings and queens. 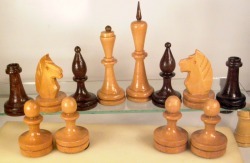 Venerable version of this typical russian style - at least pre-WW2, possibly pre WW1 - very well finished. 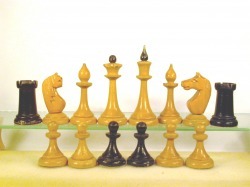 King stand 95 mm high, the finials are separate wooden pieces slotted in. 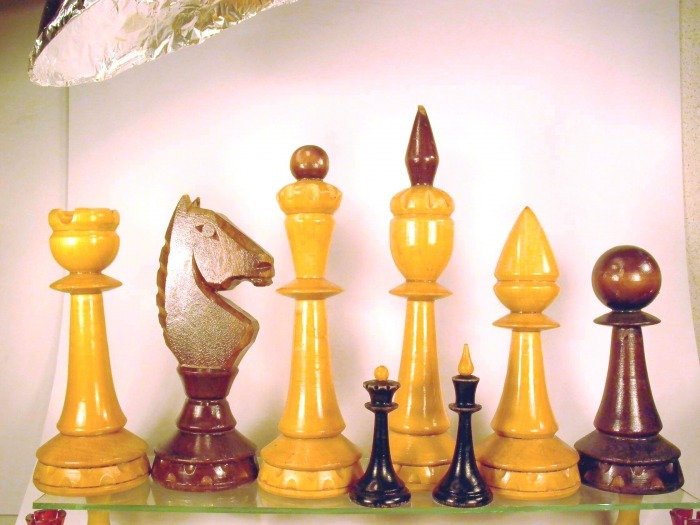 Happy knights ! 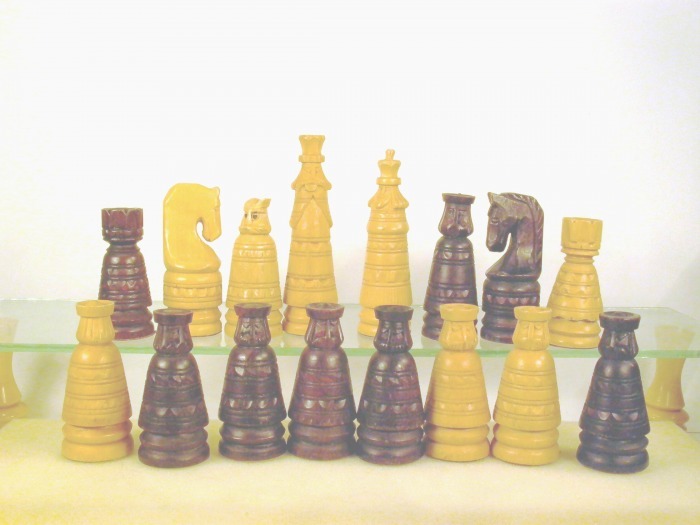 More recent set - 70ies to 80ies - with massive pieces, tall kings at 131 mm - two piece knights - mass-produced in a games factory - not for blitz games! 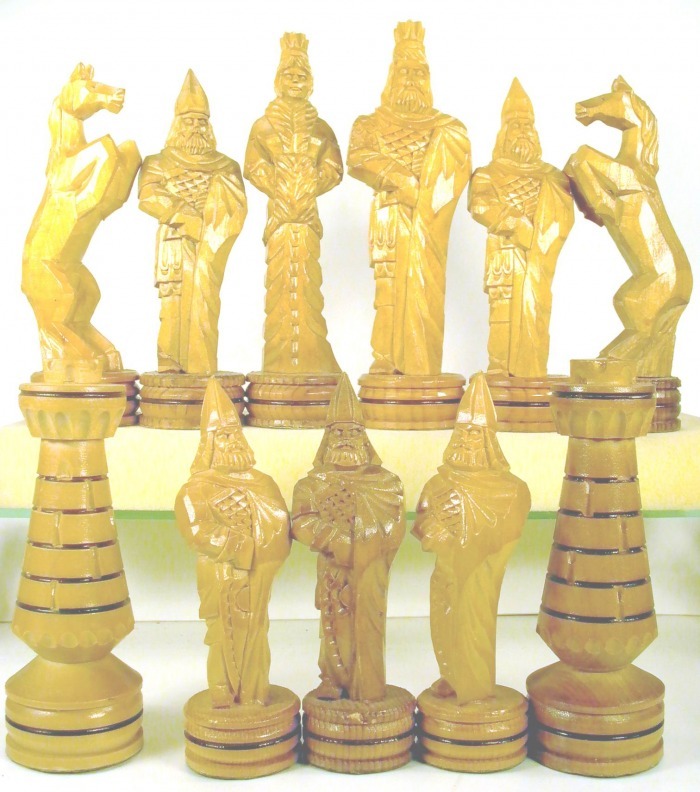 Made in a factory in Cernauti / Czernowitz/Cernovce in the Bukovina in Western Ukrania. 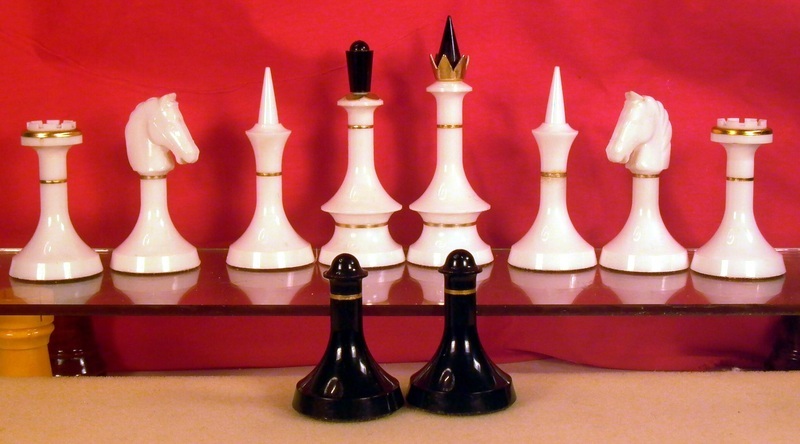 A floor version of the above, with kings at 254 mm (10 ") height! 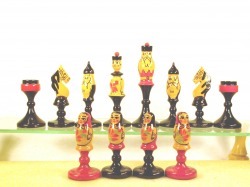 The finials are all wooden pieces, slotted into the top of the repective figures. 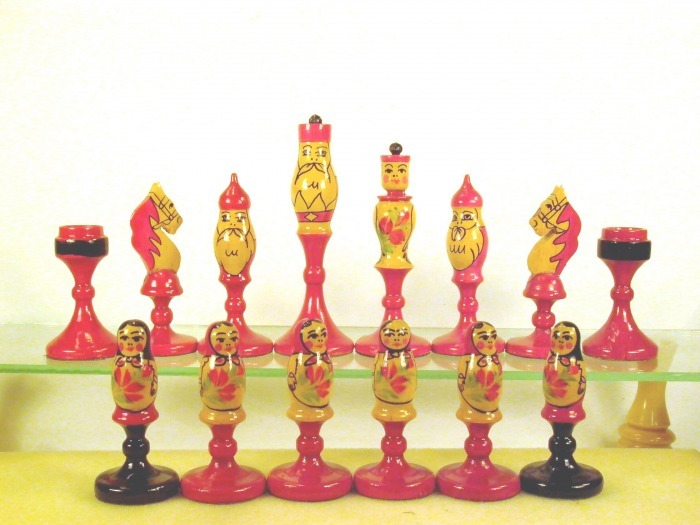 No felt - no need on the floor - but some dog bites.... made for workers sanatoriums , hospitals and rest homes, most likely in the 70ies. 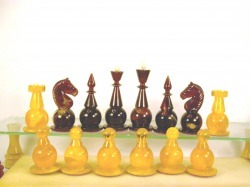 Small set - king 62 mm - with plastic tops on king and queen. 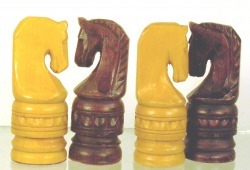 70ies - 80ies. Hardwood Set , with strongly stylized knights, natural/brown - an older folklore set, similar sets today all are machine-carved in softwood. 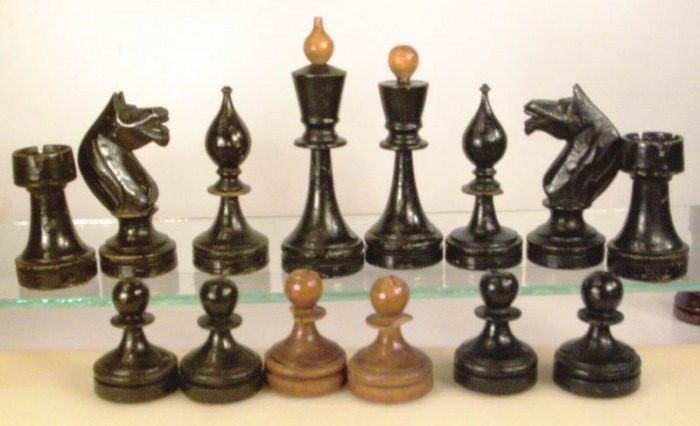 Ca . 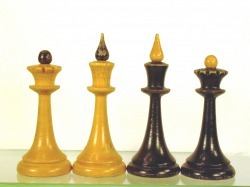 1960, king 86 mm high. 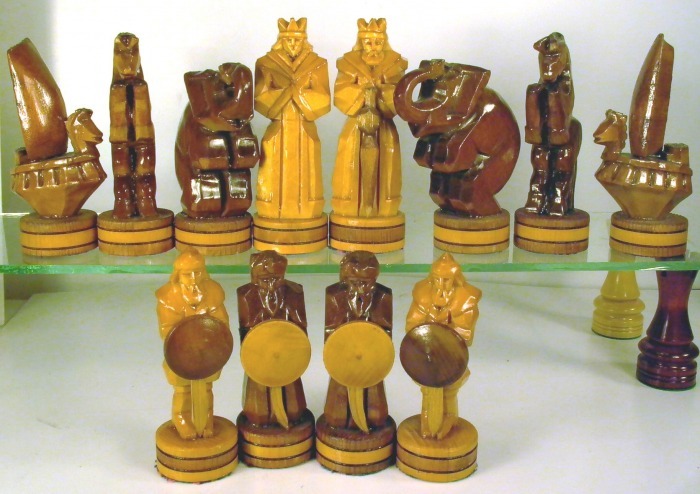 Well-made set , in maple, one side natural, other side burnished - depicts 17th century czars and soldiers - kings stand 160 mm high. 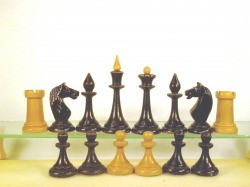 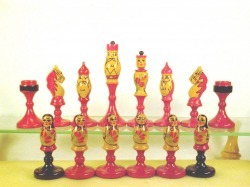 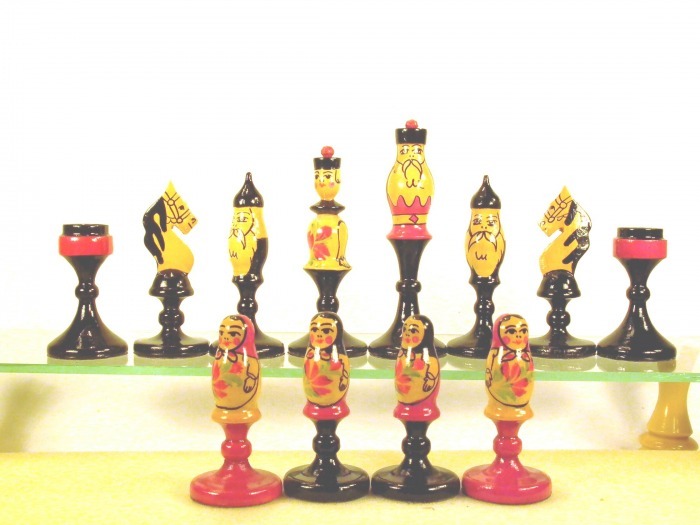 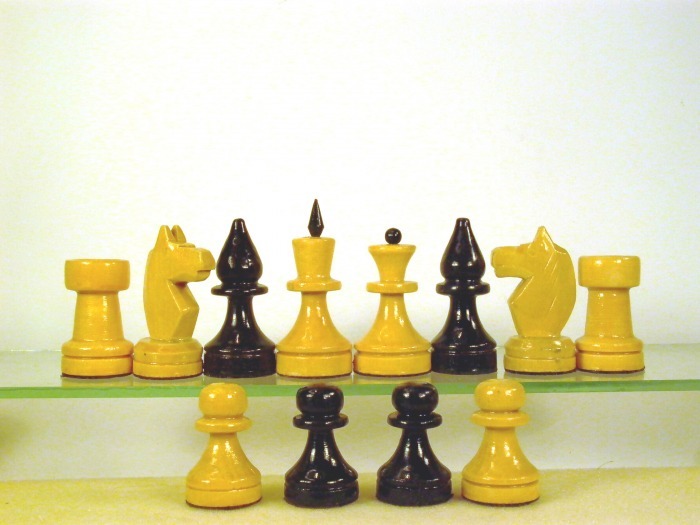 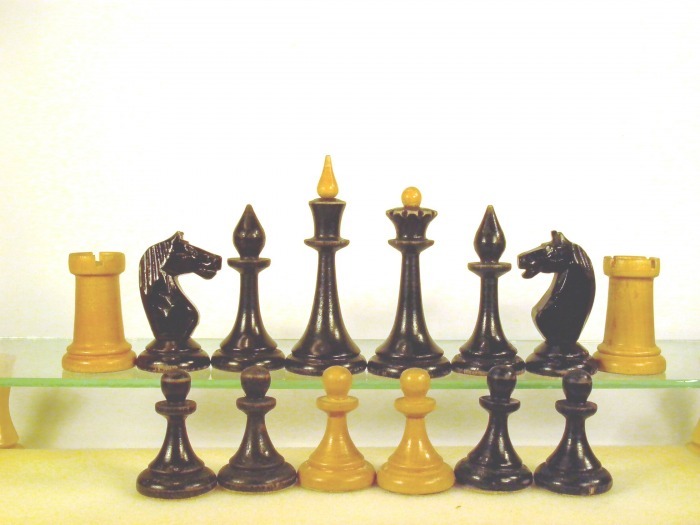 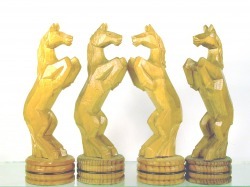 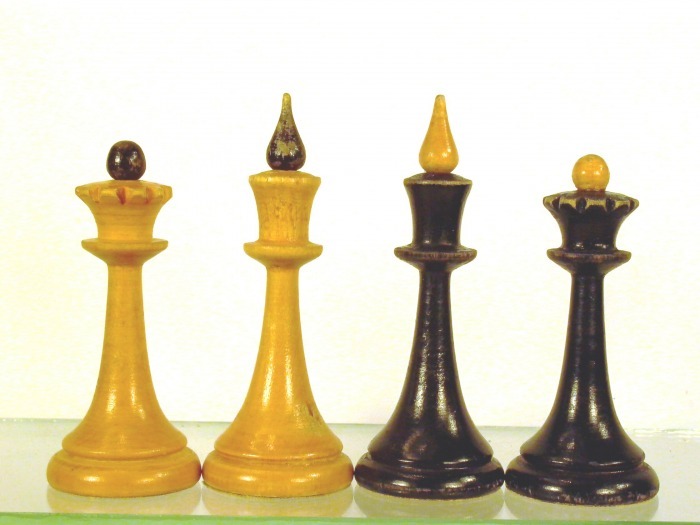 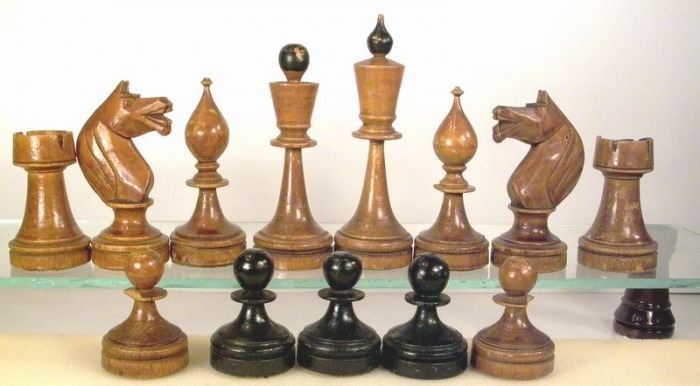 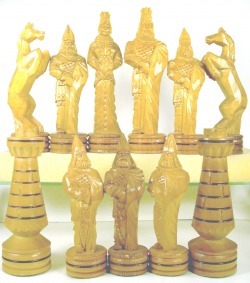 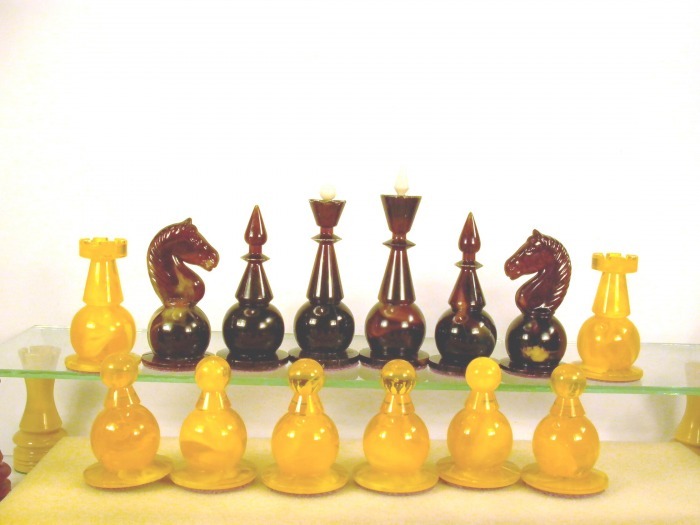 Very popular chess pieces throughout the postwar years - still being made? 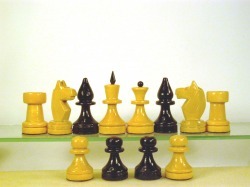 This set is older - some slight paint losses. 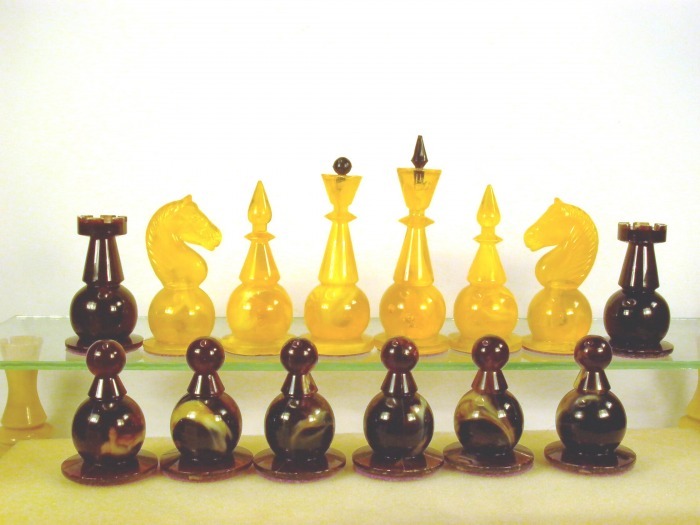 Quite astonishing plastic set, from ca. 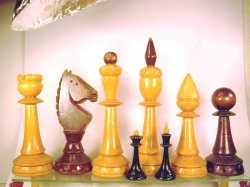 1980, in the traditional Russian form, in marbled and coloured plastic, with artistic whorls and grains. 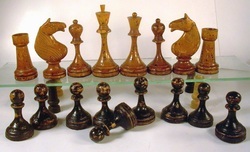 kings stands 99 mm, the set is felted, and contained in a well finsihed veneer-inlaid wooden box. The same set in different lighting can be seen here. Showy and well made softwood set from the recent Soviet past - bishops represented as elephants, and rooks as boats, according to old Russian tradition. 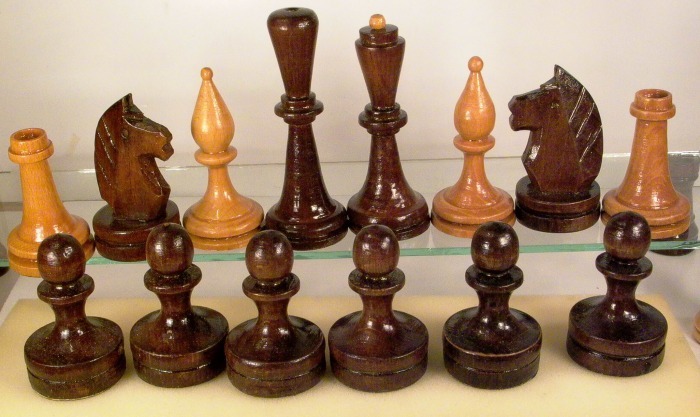 Probably from the games factory in former Frunze, Kirgistan, today called Bishkek.